MacArthur Bennie, captain of Royal Dornoch Golf Club in 1998 and 1999, suggested to the committees of neighbouring Brora, Golspie and Tain Golf Clubs that they should unite to honour and recognise the four-decade achievements of Brora player Jim Miller, pictured below in action in his 70s, on their four golf courses by way of an inter-club competition. Royal Dornoch, where Jim had majestically won 10 Carnegie Shields between 1965 and 1983, put up a trophy and the first club team competition for the Miller Quaich was played over the Golspie golf course in the spring of 1999. Royal Dornoch members had to wait four years before they got their name on the Quaich after a share with Tain and two years later sharing once more with Tain before their first outright win in 2008 at Tain. Tain Golf Club remain the current record winners with 10 outright wins and four sharing years. 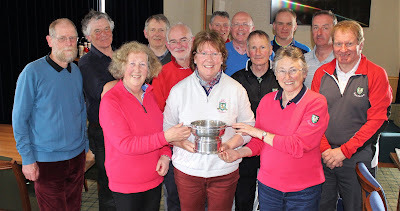 Ten years after their first solo win Royal Dornoch, hosting the 20th anniversary competition on their world ranking golf course last Sunday, won for a second time by a margin of 23pts from Golspie. Each club fielded a team of 14, 10 men and four women, with the best 12 individual Stableford scores to count. Royal Dornoch finished as winners with 387pt, Golspie 364, Tain 343, and Brora, the holders, 339. The winners had eight of their counting scores in the 30s with Colin Chessor their best with 39pts and Wilma Murray leading their four women with 35pts. Billy Melville, 37, and Sheila Robertson, 36, topped the Golspie returns while Sean Kennedy and Carole Ross were Tain's best. Brora could manage only five scores in the 30s, their best, 36pts, from Bernard Ledwith, with quite a difference in his halves: Two dozen points on the outward half but just one dozen playing into the wind on the tough, inward last nine holes. Royal Dornoch: Colin Chessor (12) 39, Wilma Murray (14) 35, Mark Kingston (12) 35, Chris Day (12) 35, Colin Taylor (2) 34, Rob Murray (6) 32, Gareth Hall (19) 32, Fiona MacDonald (21) 31, Kevin Matheson (+1) 29, Roger Boyce (20) 29, Catherine Bryce (16) 28, David MacLean (14) 28, Ian Irvine (20) 28, Bill Orr (26) 13. Golspie: Billy Melville (6) 37. Sheila Robertson (13) 36. Noelle Mackay (14) 35. Steve Doogan (5) 35. Donald Bremner (12) 34. Graham Minton (3) 33. P Woods (17) 31. Anne Macrae (11) 39. Colin Sutherland (13) 28. Stuart Richardson (13) 27. Gordon McHardy (13) 21. Fiona More (21) 18. Tain: Sean Kennedy (5) 35. Carole Ross (19) 34. Magie Vass (9) 31. Steve Holmes (5) 31. Brian MacKenzie (6) 31. Steven Lloyd (12) 31. Audrey Duncan (29) 30. Alastair Kennedy (13) 30. Duncan Bushell (11) 26. Beau Wallace (11) 22. Alex Johnson (21) 22. Harry Barnett (15) 20. Mairi Orr (18) 19. Paul Morgan (15) 17. Brora: Bernard Ledwith (28) 36. Robin Wilson (9) 32. George Sutherland (11) 32. Anne Clark (19) 30. Ken Lorimer (13) 30. Dave Lawson (13) 29. Marjorie Dixon (19) 26. Alister Bell (8) 26. Andrew Smith (16) 26. Donald Sutherland (14) 25. James Sutherland (16) 23. Angel Grant (16) 19. June Lawson (23) 16. Picture caption: The Royal Dornoch winning team; The ladies in the front are (left to right) Fiona MacDonald, Wilma Murray and Cathy Bryce. The men behind are (left to right) Ian Irwin, Roger Boyce, David MacLean, Mark Kingston, Colin Taylor, Rob Murray, Colin Chessor, Kevin Matheson, Gareth Hall and Chris Day. Missing was Bill Orr.